If you are heading off to your freshman year of college this year, this post is for you. I remember before I went, I was excited but nervous, so I read posts and watched Youtube videos all about college so I would know what to expect a bit more. While everyone’s college experience is different, there are some things that apply to many people. 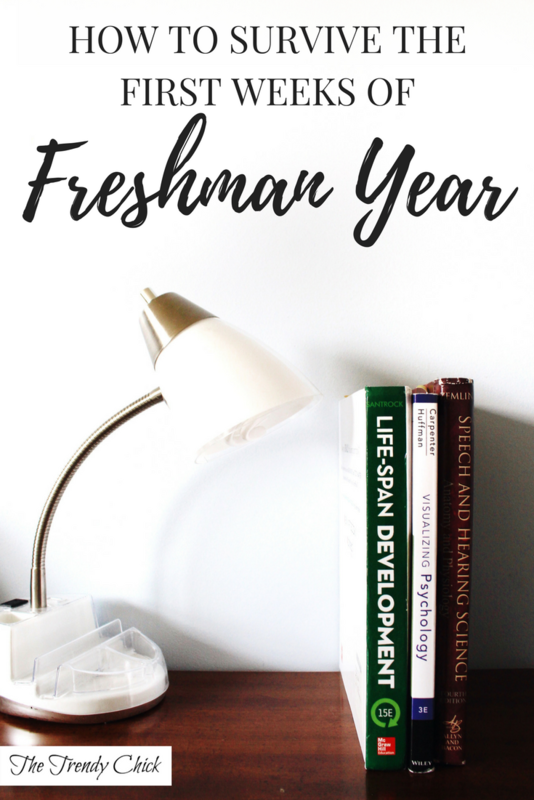 Today I am going to share my best tips for freshman year, but checkout all my other college posts here! I get it, not everyone is an extrovert. But you need to not let nerves stop you from stepping out and talking to new people. All freshmen are looking for new friends too, and I don’t ever remember trying to talk to someone freshman year only to have them snub me. If you see someone’s door open on your haul, pop in and say hi. Or talk to the people around you in class. Believe me, class buddies come in handy if you ever have to miss class, or if you want a study buddy for a test! My freshman year, everyone on my hall left their door open when they were in, unless they were changing or had a big test or something. But especially during the first month or two, it just encourages community SO much. Open doors make happy floors! Unfortunately this past year I did not have a great RA that encouraged this at the beginning, so all the freshmen left their doors shut and there really wasn’t a good floor community because of this. Don’t be afraid to make plans with the girl next door to go get coffee. Or ask the girl who sits next to you in class if she wants to grab lunch together in the dining hall! You honestly never know who will end up being your new best friend. This can be kind of difficult, because it can be easy to look at someone and think that they either look like someone you can be friends with, or they don’t. In my freshman orientation group, there were a few girls that I thought I would click with based on what they were wearing (lol) but they ended up being very different from me. Then there was another girl in my group who was wearing skater shoes, and the fashion blogger in me shuddered and immediately thought we wouldn’t be friends. But then the next day when our group was doing a service project, we ended up washing mulch together (and we still joke about this because who the heck washes mulch?! It literally stays in the dirt but whatever) and we quickly became good friends! Throughout the past few years we have gone on lots of adventures, and even ended up having a class together last semester. She even drove down to visit me this summer, which was SO fun! So going back to the point, just be sure to give everyone a chance. Especially during those first few weeks, it is important to say yes to lots of things. Honestly if someone asks you out once or twice and you say no, they will probably stop asking since they don’t know you that well. Going along with this, try to attend freshmen events, because you will meet so many people who are in the same boat as you! The dining hall is such a great way to make friends, because it is basically just a big social event. Why eat alone at a small table when you could join a big table of 10 of your good friends? My freshman year almost my whole floor ate together every single night, and I got really close to many people on my floor due to that! I also know people who met a good friend just by sitting near them in the dining hall!